In addition to the upcoming Wallykazam! 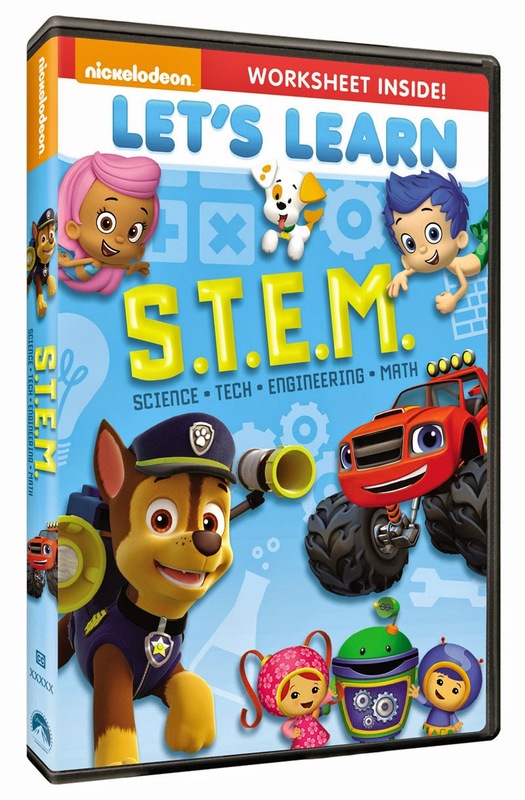 DVD which we were sent this week and I just shared a review of, the folks at Nickelodeon and Paramount Home Media Distribution also sent along Let's Learn: S.T.E.M. on DVD for the girls and I to review, this past Friday. Like Wallykazam!, this new DVD also arrives in stores next Tuesday -- so, keep an eye out for it, if you don't pre-order a copy now from Amazon or other major retailers. Here is more about Let's Learn: S.T.E.M., which is perfect for preschoolers. "The fifth installment in the Nickelodeon’s Let’s Learn series introduces preschoolers to the exciting world of Science, Technology, Engineering and Math (S.T.E.M.). Join some of your favorite characters from hit preschool shows such as Blaze and the Monster Machines, Bubble Guppies, PAW Patrol, Team Umizoomi, Blue’s Clues and Dora the Explorer for exciting adventures in this brand-new DVD containing over 130 minutes of educational entertainment. Each DVD contains a S.T.E.M.-themed worksheet as a free gift with purchase while supplies last. Created by Nickelodeon and distributed by Paramount Home Media Distribution, Let’s Learn: S.T.E.M. will be available on DVD on April 28, 2015 for the suggested retail price of $14.99. I love when DVDs like this come out and include a variety of shows from Nickelodeon, for my girls to enjoy. And, seeing that all the shows on this television network are educational based, it makes for a great teaching tool for things like math, science, literacy, etc, especially if you are homeschooling your child or helping them prepare for kindergarten or preschool. Savannah, who is a huge Paw Patrol fan, went crazy when she saw this new DVD as it contains a Paw Paw episode, and had Chase on the front cover. Anything with Paw Patrol on it, she has to have. So, she quickly scooped up the DVD and gave it a once over before asking to watching the DVD (preferably the Paw Patrol episode first), before adding this DVD to her shelf of Paw Patrol DVDs. Overall, my girls had a blast watching all six S.T.E.M. themed episodes. Can you guess which one was Savannah's favorite? Yep, the Paw Patrol one -- which, we watched half a dozen times in a three-day period. Bella kept asking for the Bubble Guppies and Blue's Clue's episodes. And, both girls couldn't stop talking about what they learned and acting out scenes from the shows all weekend long. This is definitely one DVD you will want to pick up and add to your child's Nickelodeon DVD collection, as it will be one that will be watched over and over again. About NickelodeonNickelodeon, now in its 35th year, is the number-one entertainment brand for kids. It has built a diverse, global business by putting kids first in everything it does. The company includes television programming and production in the United States and around the world, plus consumer products, online, recreation, books and feature films. Nickelodeon’s U.S. television network is seen in almost 100 million households and has been the number-one-rated basic cable network for 19 consecutive years. Nickelodeon and all related titles, characters and logos are trademarks of Viacom Inc. (NYSE: VIA, VIA.B). I love dvds like this for little kids to learn early about these things.